Hellooooo!! It’s Wednesday, which means it’s technically my Friday! I only have class Monday through Wednesday this year because I’m only taking 3 official classes (my thesis counts as 2 classes), which means I get a 4 day weekend! I know it sounds cool, but between practice, blogging, and actual homework, time gets filled up prettttty fast, I tell ya. I feel like I haven’t actually talked about my own workouts for ages! (Except for this weekend’s 5K and soccer, I guess). I assure you, however that I have been keeping active, but I just haven’t been blogging about it. So! Why not share my activities from yesterday? In a nutshell, I. was. pooped. at the end. 12:30 pm – 1:00 pm: Solo hit before lunch. Not exactly a workout, just skill session by myself. It’s been a while since I’ve done a solo hit, and I was excited to break up my day of school work and class. 4:50 pm- 5:25 pm: Spin with the team. Lots of sprints, and it was hard! I also made the mistake of not bringing a water bottle down to the courts with me, so thanks to all of my yelling encouraging, my throat became quite dry. 5:30 pm – 6:30 pm: Squash drills and games. 6:45 pm – 7:30 pm: Coaching with the Princeton Junior Squash program. Basically, me just feeding shots to little kids for 45 minutes. 7:30 pm – 8:30 pm: Hitting with the older PJS kids. I actually really enjoyed hitting with these guys, but I was starting to fade mentally by this point. Thanks to my 3pm pre-workout snack of an apple, oatmeal, and peanut butter, I didn’t feel like my energy levels had bonked, but I was so thirsty. Oof, it was exhausting just writing all that out! How about some food to balance out all that exercise? 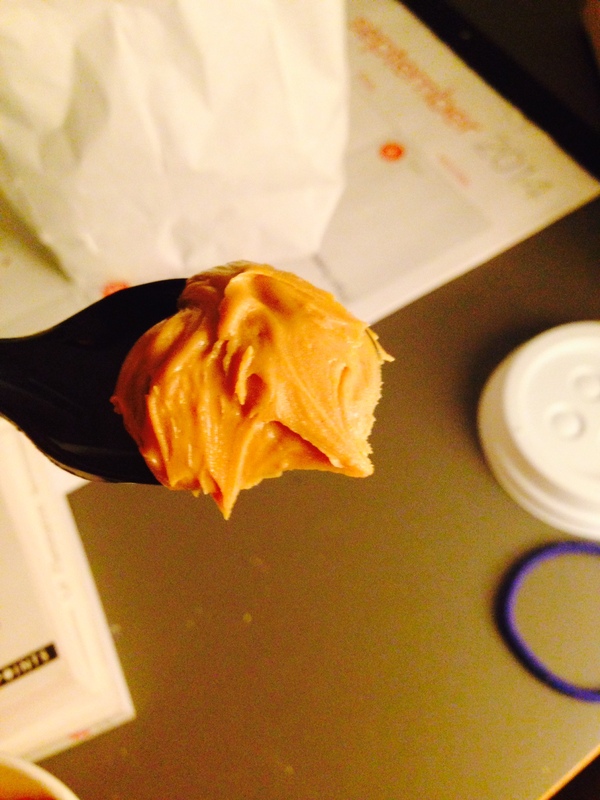 In honour of Wednesday, I’m linking up with Peas and Crayons for another What I Ate Wednesday- thanks Jenn! I stopped by the C-store (convenience store on campus) to pick up some of my “special” trail mix before heading home. 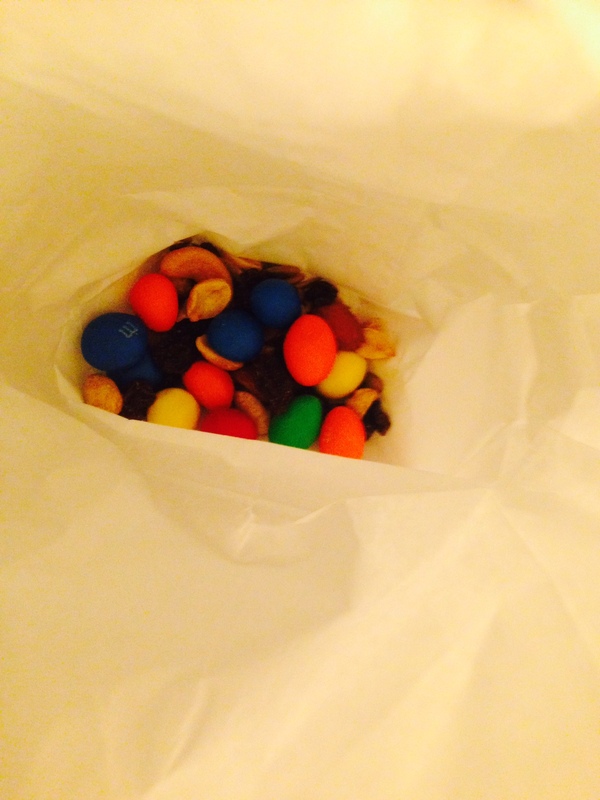 What makes my trail mix so special? I awkwardly sit and pick out (with the tongs) the almonds, cashews, peanuts, and chocolate covered peanut M&M’s, and carefully avoid the raisins and random seeds. I used to be self conscious about this weird habit, but I’ve finally reached the point where I no longer care at all. Do watcha gotta do! To say I was having a chocolate craving last night would be an understatement. 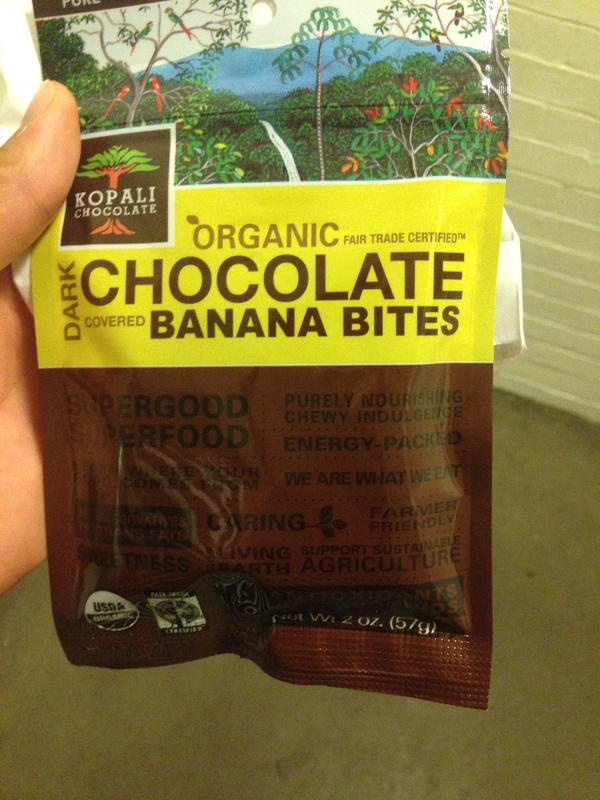 On my way out, this glossy bag of organic dark chocolate banana bites called to me. I somehow failed to read the word “chewy” on the front of the package, and was expecting chocolate covered banana chips, and was happily surprised to see that they weren’t like that at all! I’m not a huge fan of dried banana chips, and I was stoked when I opened the package to find these Raisinette-type bites inside. It gets even better: each little pebble is packed with flavour, and reminded me a whole lot of chocolate chip banana bread! These little bites are going to be my new pick me up, they’re absolutely delicious. This morning’s breakfast was a little weird, and consisted of some cashews, a banana with peanut butter, half a bagel with peanut butter, and a cup of strawberry Chobani Greek yogurt. It was a fairly substantial breakfast, but I was still famished by the time 12:30 rolled around, and I was able to sit down to lunch. 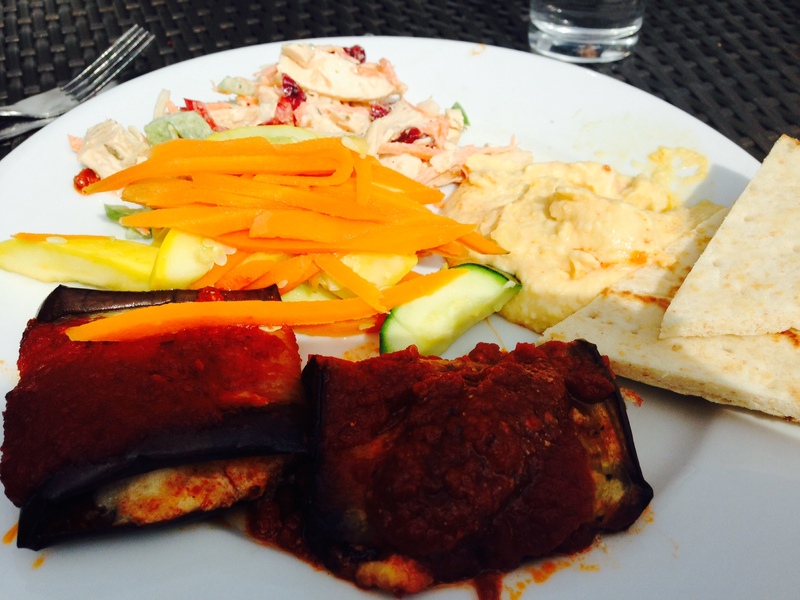 On the menu today was grilled eggplant lasagna, chicken salad, steamed veggies (squash, zucchini and carrots), and warm hummus and pita! The chicken salad was delicious and not mayo-y at all (I hate mayo), and I went back for seconds. 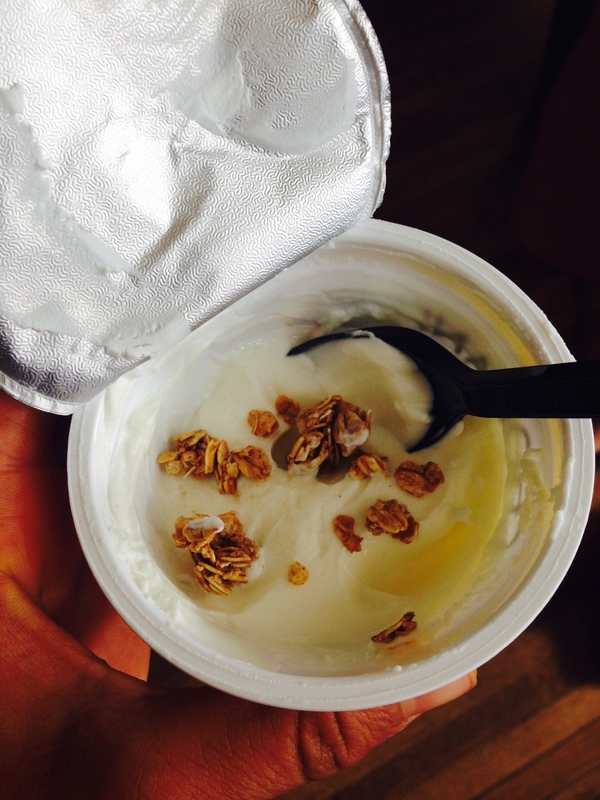 I finished lunch off with a cup of 2% pineapple Chobani Greek yogurt and a little granola. Don’t be fooled by the minuscule amount of granola in the picture above. There was a lot more, I assure you! Well, I was planning on talking about Matt Fitzgerald’s talk on the 80/20 rule of endurance training, but 1) this post is long enough, and 2) I should really get back to listening to this lecture. (No, I’m not kidding). Have you ever had dark chocolate banana bites? Do you like chocolate covered dried fruit? Usually I’m not the biggest fan of chocolate covered dried fruit (blueberries, cherries, bananas, etc), but apparently I am a banana bite lover! Those banana bites sound good!! 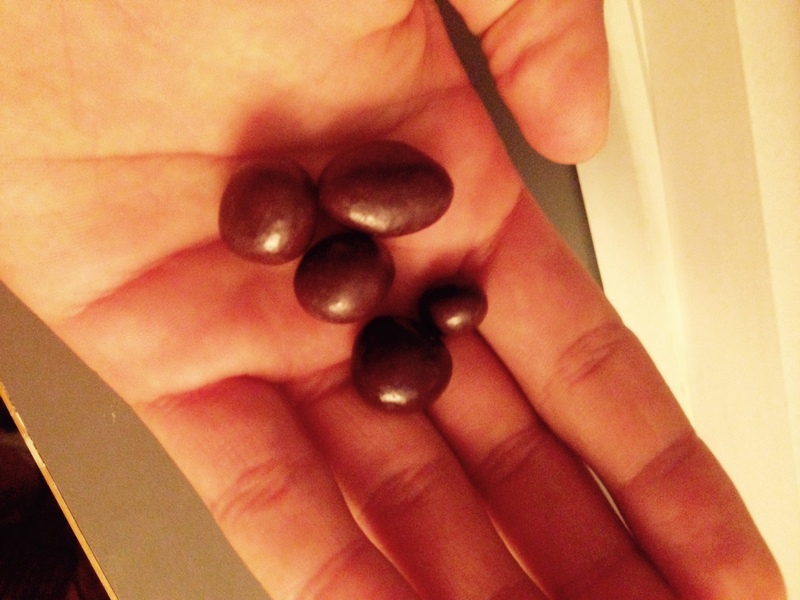 I like chocolate covered almonds, chocolate covered pretzels… but not chocolate covered raisins haha. That’s the only one I don’t like! Those banana bites certainly sound delicious 🙂 !